Most people talk about the new year as if it is waiting to be colored by the palette of pure choice and unlimited possibility. 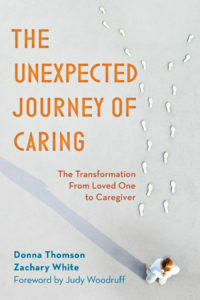 For those of us caring for someone in need, however, the future is oftentimes filled with uncertainty as life seems to come at us unexpectedly, contorting us into feeling powerless and claustrophobic. “Once this is over, then…” This orientation to the future is based on the type of linear thinking that presupposes we have complete control of what is to come. It’s a favorite amongst young people whom have been trained to believe the present is worthy of enduring only because of what it might lead to—graduation, better job, raise in salary, marriage, etc. Planned expectations about the future can sometimes be sources of motivation, but we need protection from these beliefs when our current caregiving situations don’t fit with others’ narratives of control. For us, the future may seem so ambiguous or so dire that we can become consumed in what might happen that we are prone to overlook what might be clearly before us and within our control. If we can resist the temptation to become preoccupied with the belief that our present situation is worthless but for what it might lead to, we can better protect ourselves from the tendency to simply endure the present and risk overlooking what might be precious in the moment. “You’re next diagnostic will be in . . .” For caregivers, our schedules are often determined for us—from one test to the next, from one doctor’s visit to the next, from one rehabilitation visit to the next. Next appointments, as guides to the future, are worthy and necessary. However, others’ appointments for us and our loved ones can also make it more difficult to make sense of the never-ending, always something more, out of control feeling that accompanies diagnostic thoroughness. In the process, our hopes and expectations can’t help but be dragged from one appointment to the next—days, weeks, and months into the future—leaving us feeling that peace of mind cannot be achieved until the next appointment, the next confirmation, the next blood test, the next screening, the next second opinion. Amidst this seemingly never-ending waiting game, we need to protect ourselves from the belief that life can only be appreciated after we reach the next milestone. When in the grip of nexts, we must remind ourselves that peace of mind must not be deferred to some future date, rather it is our challenge to find and create it now without always having to wait for others to tell us so. “First and last . . .” This organization of time requires us to chronologically sequence our experiences in a series of first and lasts. Once we use the labels of “firsts” and “lasts,” we can’t help but find ourselves changed. In the days and months leading to the labeling of a loved one’s “lasts”—treatment, visit, appointment, conversation, goodbye—our minds can’t help but be consumed in categories that inevitably leave our bodies adrift in the moment, nullifying our capacity to be present. Organizing our experiences in this way means that our awareness of the present can’t help but become blinded with the glare of lasts. When this happens, we get caught in an endless cycle of waiting for what is to come and yearning for what once was. If we are fixated on marking firsts and lasts, we may miss out on the opportunity to mark our middles and invite our thoughts and bodies to experience the everyday in unison, featuring the unfolding now as our most treasured source of control. For some, the new year is a time to deny the present and imagine a life waiting to be crafted into a sculpture of our own making. For caregivers, the future sometimes feels like shards of glass, ready to cut us if we handle it without care. When tempted to get caught up in what may happen, we must remind ourselves that how we think about the future inevitably changes how we allow ourselves to experience the present. Wonderful, wise advice. Thank you, sharing.